The following article was first published at Alternet.org. This expanded version includes footnoting of the textbook quotes. In twelve states and the District of Columbia, almost 200,000 students attend private schools with at least part of their tuition paid with public funds. The money is taken from public school budgets to fund vouchers or by diverting state tax revenues to tuition grants through corporate tax credit programs. An interconnected group of non-profits and political action committees, led by the wealthy right-wing school privatization advocate Betsy DeVos and heavily funded by a few mega-donors, is working to expand these programs across the nation. The DeVos-led American Federation for Children hosted Pennsylvania Gov. Tom Corbett, Wisconsin Gov. Scott Walker, and Michelle Rhee at a national policy summit earlier in May. Take a look at what growing numbers of students are being taught with taxpayer funding. The textbook quotes are followed by a description of the Florida tax credit program, the largest of its type in the country. 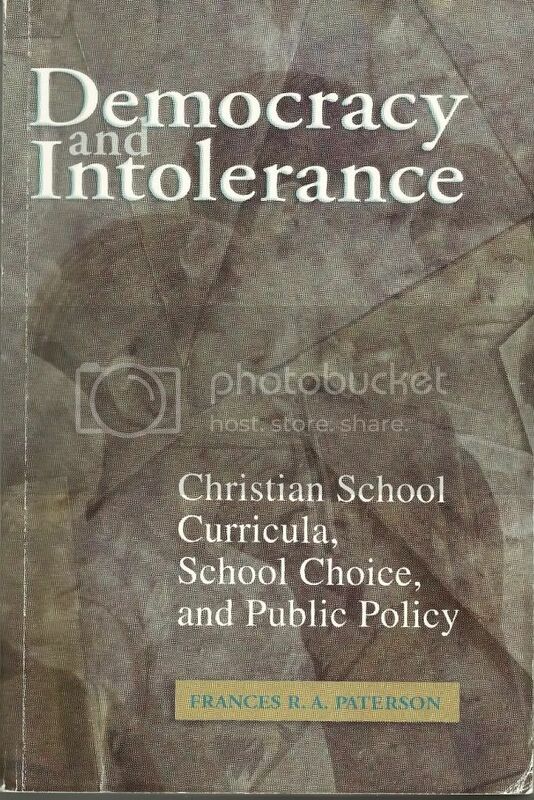 In 2003, Dr. Frances Paterson, a specialist in education law, published Democracy and Intolerance: Christian School Curricula, School Choice, and Public Policy summarizing her extensive study of the curricula of the three most widely-used Protestant fundamentalist textbook publishers in the nation: A Beka Book, Pensacola, Florida; Bob Jones University Publishing, Greenville South Carolina; and Accelerated Christian Education, Lewisville, Texas. Her research included surveys in Florida, including one of private schools receiving public funding in the Orlando area. Of those that responded, 52% used A Beka textbooks, 24% used Bob Jones and 15% used ACE. A Beka publishers reported that about 9,000 schools nationwide purchase their textbooks. In 2003, the Palm Beach Post conducted its own survey of Florida's voucher schools, and, of the religious schools that responded, 43% used either A Beka or Bob Jones curriculum. The percentages may be higher in Florida than some other states; however, these three curricula series are used by thousands of private schools across the country. The textbooks' position on social issues are virulent anti-gay, similar to those of Religious Right organizations (heavily funded by Betsy DeVos and family) that have been labeled as hate groups by the Southern Poverty Law Center, and they are fiercely anti-abortion; but they also teach a radical laissez-faire capitalism. Government safety nets, regulation, minimum wage, and progressive taxes are described as contrary to the Bible. Many of these textbooks were first published in the 1980s, evidence that the merging of Religious Right ideology with extreme free market economics predates the Tea Party movement by many years. The textbooks exhibit hostility toward other religions - Islam, Hinduism, Buddhism, Shintoism, traditional African religions, and Native American religions - and other Christians are also targeted, including non-evangelical Protestants and Roman Catholics. All three series include biblical Creationism in their science curriculum. The following textbook quotes about social issues, science, history, government, economics, and religion, are taken from Dr. Paterson's documentation or directly from my own collection of textbooks from the three publishers. Paterson's book summarizes the worldview of government and politics presented in these texts with the title "Deluded Democrats, Liberal Villains, and Conservative Heroes." As Paterson points out, these texts use descriptors for people and groups "that make clear to the reader that some are more acceptable than others and that many are simply unacceptable." These texts are less militantly Christian nationalists than some other homeschooling and private school textbooks, such as the popular America's Providential History. Nevertheless they present a view of the nation's history and government that parallels that of the Religious Right. Predating today's "tenther" movement, the texts consistently accuse the federal government of exceeding its constitutional authority as described in the Tenth Amendment and taking powers that belong to the states. The Fourteenth Amendment, passed during Reconstruction to give citizenship to African Americans, is criticized as taking away state's rights. Ironically, the same A Beka text claims that the New Deal prolonged the Depression. The purpose of the Taft-Hartley Act, which began to unravel New Deal legislation, is described as "to remove certain labor abuses and to curb the growing power of labor unions over individuals and employers." Throughout these texts the tone of despair changes as President Ronald Reagan's presidency is celebrated. A fourth-grade A Beka text announces the administration of Ronald Reagan under the heading "A Return to Patriotism and Family Values," while the high school text announces it as a "revival of patriotism. Even after the dissolution of the Soviet Union, the textbooks continue to promote fears of communism invading American life. An A Beka text states, "It is no wonder that Satan hates the family and has hurled his venom against it in the form of Communism. "17 The same text claims "history shows socialism gradually opens the door to Communism." The terms socialist and socialism are used repeatedly in references to Democratic presidents. These textbooks provide a window into a worldview that has recently impacted the political scene - the merger of social conservatism with radical free market ideology. Global warming is presented as a theory that is "simply not supported by scientific evidence,"19 and is supposedly promoted by environmentalists for destructive reasons, according to the A Beka economics text. ""Global environmentalists have said and written enough to leave no doubt that their goal is to destroy the prosperous economies of the world's richest nations." In the same text a graphic of Bruegel's famous painting of the biblical Tower of Babel is followed by a presentation of globalism in conspiratorial "one-world government" terms. This chapter on globalism describes the forces behind a one-world government as the United Nations, European Union, trade agreements (because they take away sovereignty), peace organizations and environmentalists, but includes no criticism of multi-national corporations. A sidebar in the chapter on globalism explains that many Christians believe that that this "drive toward a one-world government fits in with prophecies" about the Antichrist and the end times. The authorship of this text is credited to the late Russell Kirk, an economist awarded the Presidential Citizens Medal by President Ronald Reagan. The edition from which I took the above quotes was published after Kirk's death, but still lists him as author. The text includes lessons in the form of fictional accounts of companies. For example, the fictitious Gray Iron Fabricating is described as failing due to the National Labor Relations Board, the Occupational Safety and Health Administration, and lawsuits: one brought by the widow of a man electrocuted on the job (he failed to follow safety instructions), and a second by a female junior executive who was passed over for a promotion in favor of a man. This section of the text is followed by a cartoon and the story of "The Goose That Laid the Golden Eggs"- implying that government and greedy workers are destroying businesses. At first glance, much of the material is little different from other science texts. However, each of the ones I have collected contains a chapter or section on creationism, and, on closer inspection, it becomes clear that no instruction is included in the text that would conflict with young earth creationism, the belief that the earth is only a few thousand years old. A quiz in the teacher's guide for the A Beka eighth grade text Matter and Motion asks, "Why did superstition take the place of science during the Middle Ages?" The answer key tells us, "People did not have the Bible to guide them in their beliefs. Many looked back to the false ideas of Aristotle. "23 The next question is, "Why did modern science begin so suddenly in the 1500s?" The answer given is, "As people returned to the authority of the Scriptures during the Protestant Reformation (1517), they started learning the truth about God and His creation." A three page section in this A Beka text leads with a headline "Two Faiths: Creation and Evolution" and states, "Creation, not evolution, is based on a reasonable faith. "24 The section on Darwin is headlined "Evolution: Faith Disguised as Science. "25 A Bob Jones science text includes a chapter titled "Biblical Creationism," claiming that evolution cannot be a part of science, since it can not be observed and must be accepted by faith. Paterson described the texts as "having an arrogance and hostility toward non-Western religions that is truly breathtaking"
An A Beka grammar school text states that traditional African religions are "false religious beliefs" from the Egyptian descendants of the biblical figure Ham.28 A fifth-grade text tells a narrative of a great chief who was a Christian convert, although his subjects were "ruled by witchcraft," and drank corn beer that made them "lazy and wicked. "29 The claims of witchcraft are ironic given the fact that many of the schools using these textbooks are associated with churches that have joined the current wave of obsession with witchcraft and expelling demons. All three publishers stress the need for missionary work and reject religious pluralism. Non-Christians are described as living in "spiritual darkness," which is credited as the source of poverty and societal ills. These statements are not factual and were not in 2004, when this text was published. Paterson points out that several textbooks claim that Chinese ideographs indicate that the Chinese people once had access to "biblical truth" but later embraced false religions including Confucianism. I've seen this curious and factually-flawed argument in a number of other sources that claim, for example, that the Chinese character for boat indicates that ancient Chinese knew of the Noah story. An A Beka text reads, "the doctrines and practices of the Roman church had digressed so far from Scripture that the church was compelled to keep its members from reading the Bible and discovering the truth. "37 The A Beka text also repeatedly uses the term Romanism, which has pejorative connotations and has been used as a slur against Catholics for generations. It is still used by apocalyptic televangelists, like John Hagee, claiming that "Romanism" is the biblical "Whore of Babylon" in his descriptions of the destruction of Rome and the Catholic Church in the end times. In a perverse irony, the pro-voucher proponents working to remove the clauses in state constitutions that prevent public funding of religious schools, claim that this must be done because these "no aid" clauses, also known as Blaine Amendments, are a vestige of historic anti-Catholicism. The worldview of these textbook publishers impact areas that you might not suspect, including choosing phonics over whole language reading instruction and rejecting the teaching of set theory in mathematics, both on religious grounds. The A Beka publishers advertise the math curriculum as, "A Beka Book provides attractive, legible, workable traditional mathematics texts that are not burdened with modern theories such as set theory." Florida's Corporate Tax Credit Program - Do They Know What They Are Funding? According to the 2010-2011 yearbook of the Alliance for School Choice (the 501(c)(3) under the DeVos-led American Federation for Children umbrella), Florida has the largest "school choice" program in the country, followed by Pennsylvania, Arizona, Wisconsin, and Ohio. Over 54,000 tuition recipients are enrolled in private schools in Florida, with the majority of these students in a corporate tax credit program that allows businesses to divert their taxes, dollar for dollar, up to 75% of taxes owed to the state. Florida currently has a voucher program limited to special needs students, since the state's Supreme Court struck down a more expansive program in 2006. The Florida House and Senate have approved a ballot initiative for the 2012 election to try to remove the "no aid" clause in the state's constitution that would open the door to Gov. Rick Scott's vouchers-for-all scheme. As of February 2011, 83.8% of the students in the Florida tax credit program were attending religious schools, approximately the same rate as Milwaukee's voucher program. However, unlike Milwaukee, hundreds of the Florida schools fall into the category of right-wing evangelical or fundamentalist, with many using A Beka, Bob Jones, or ACE curriculum. The Step Up For Students reports describe the typical student in the tax credit program as a minority from a one-parent home. Currently 35.6% are African American and 27.5% are Hispanic. The organizations glossy reports tout the improved opportunities of the students provided with tuition grants to private schools. The Florida tax credit program is voluntarily supported by corporations including AT &T, Burger King, CVS, Lowe's, Marriott, Sysco Food Services, and others, described in the Step Up For Students annual reports as "receiving a high rate of return on their investments." Do these corporation know what they are supporting? The Step Up For Students reports and other pro-privatization propaganda openly report the participating private school's use of the curricula series quoted in this article, without revealing what that means. The Step Up For Students reports also fail to include the fact that some American universities refuse to accept high school credit for courses taught from several textbooks quoted in this article. University of California specifically cited several A Beka and Bob Jones textbooks and, although challenged in court, won the case. Some of the glowing testimonies in the Step Up for Students annual report include this 2008 description of Bible Truth Ministries Academy. "Students are divided into multi-grade learning groups and taught with the Accelerated Christian Education curriculum, which is self-paced and has allowed some of the students to advance well beyond their grade level." The 2007 annual report features Esprit De Corps Center for Learning in Jacksonville. Next to a photo of smiling African American children, smartly attired in uniforms and berets, the curriculum is touted. "Using an A Beka curriculum designed to challenge students to reach their full potential, the school offers outstanding academic programs that provide its students with the skills and knowledge to become active, productive members of society. [...] EDC has partnered with Step Up For Students since its inception." When the Palm Beach Post conducted its survey in 2003, The Potter's House Christian Academy was one of the major recipients of voucher funding and reported using both the A Beka and Bob Jones curriculum series. The school is affiliated with the politically influential Jacksonville mega-church, The Potter's House Christian Fellowship, led by Bishop Vaughan McLaughlin. This tax credit program money could have been used to improve Florida's urban public schools, but that would not serve the purpose of indoctrinating the largely minority recipients of the tuition grants to the right-wing religious worldview found in these textbooks. As Frances Paterson states in her research, Americans absolutely have the right to send their children to schools that use these fundamentalist curricula. But she adds, "The public policy makers can and should ask whether the alternative system of Christian education for which they seek public approval and support is ideologically driven in ways that run contrary to the best interests of a diverse, democratic society." Meet the Super-Wealthy Right-Wing Family Working with the Religious Right to Kill Public Education. 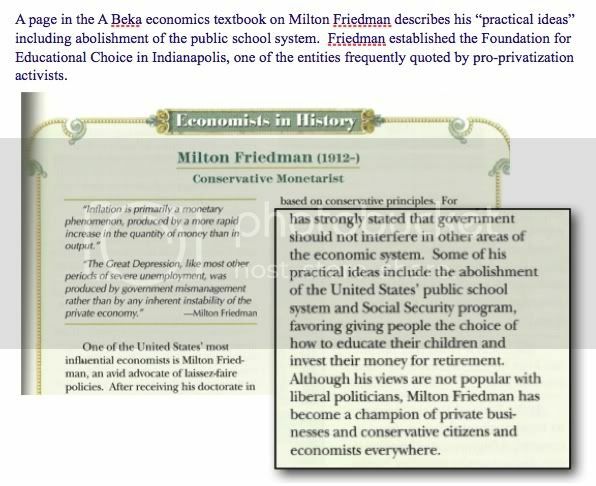 The textbooks were quoted directly from the volumes in my own collection or from Democracy and Intolerance: Christian School Curricula, School Choice, and Public Policy by Frances R. Paterson, published by Phi Kappa Educational Foundation, Bloomington, Indiana, in 2003. George Thompson and Jerry Combee, World History and Cultures in Christian Perspective, Teacher Edition, 3rd ed. (Pensacola, FL: A Beka Book, 1995), p. 445. Teacher's Resource Guide to Current Events for Christian Schools, 1998 - 1999 (Greenville, SC: Bob Jones University Press, 1998), p. 34. Timothy Keesee, American Government for Christian Schools, Teacher Edition (Greenville, SC: Bob Jones University Press, 1998), p. 138. Bowen et al., p. 17. Bowen et al., p. 19. Timothy Keesee and Mark Sidwell, United States History for Christian Schools, 2nd ed. (Pensacola, FL: A Beka Book, 1991), p. 219. Michael R. Lowman, George Thompson, and Kurt Grussendorf, United States History: Heritage of Freedom, 2nd ed. (Pensacola, FL: A Beka Book, 1996), p. 219. Keesee and Sidwell, pp. 478 - 479. Approaching the Twenty-First Century, Self-Pac of Basic Education (#108) (School of Tomorrow/Accelerated Christian Education, 1996), p. 16. United States History: Heritage of Freedom, p. 537. United States History: Heritage of Freedom, p. 633. Bowen et. al. p. 31. 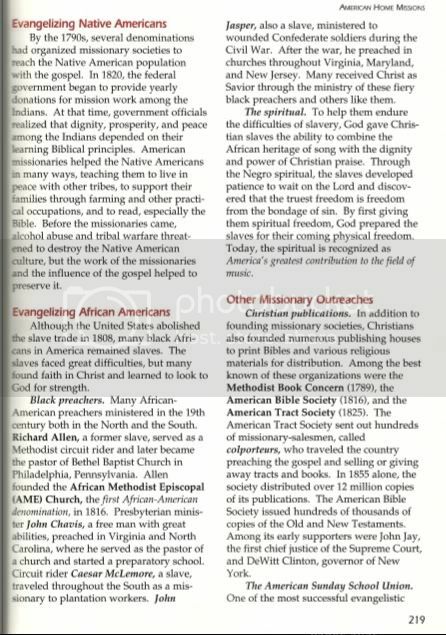 United States History: Heritage of Freedom, p. 670. Russell Kirk, Economics: Work and Prosperity in Christian Perspective, 2nd ed. (Pensacola, Fl: A Beka Book, 1999), p. 253. Russell Kirk, p. 237 - 240. Gregory Rickard and Gregory Parker, Observing God's World, 3rd ed. (Pensacola, Fl: A Beka Book, 2001), p. 356. Matter & Motion in God's Universe, Text and Quiz Book Key (Pensacola FL: A Beka Book, 1996), p. 39. Matter & Motion in God's Universe (Pensacola, Fl: A Beka Book, 1994), p. 288. Matter & Motion, p. 280. Old World History and Geography (Pensacola, FL: A Beka Book, 1991), p. 247. Old World History and Geography, p. 252. Old World History and Geography in Christian Perspective, 3rd ed. (Pensacola, FL: A Beka Book, 2004), p. 215. America: Land That I Love, p. 220. George Thompson and Jerry Combee, World History and Cultures in Christian Perspective, 2nd ed. (Pensacola, Fla: A Beka, 1997), p. 47. 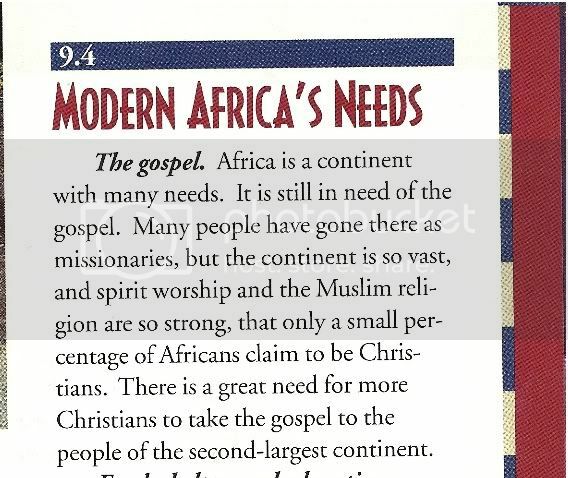 World Studies for Christian Schools, Teacher Edition (Greenville, SC: Bob Jones University Press, 1993), p. 180. Approaching the Twenty-first Century Self-Pac of Basic Education (#108), p. 51. Heritage Studies for Christian Schools 6: Eastern Hemisphere Nations (Greenville, SC: Bob Jones University Press, 1986), p. 174. David A. Fisher, World History for Christian Schools, Teachers Edition, 2nd ed. (Greenville, SC. : Bob Jones University Press, 1994), p. 114. I'm hoping that this will rattle the complacency of people who think regarding the dominionist churches "But it's a Church, it can't be THAT BAD!!!" They still think in terms of everything being 'politics as usual', not seeing the threat this country is under (from within and by the people who are generally considered to be "good Americans"). ...that this will get exposure. People think that they know what's in these textbooks, but most don't. For several years I was trying to explain to a history teacher in my family what was in these textbooks, but elicited little concern. One day I put a few of the text in front of her and left the room to make tea. Within a few minutes she had jumped out of her seat and was yelling. I think you have to see it for it to fully sink in that a generation of children in America are being indoctrinated in this way. This is almost prophetic. This also clearly illustrates the hellhole in which I live (and dream of escaping) - central Florida west of Orlando (and this hellhole of a county is many times more conservative and dominionist than Orlando EVER was - that area is flaming liberal compared to this county). Even the so-called "non-fundamentalist" Christian schools are teaching that crap (and they also hint at it in the public schools - see H. Roy Kaplan's "Failing Grades" and the things he encountered, which were actually relatively mild compared to what I've heard about). We need to stop mincing words and call it what it is - LIES. I'm seeing more and more of the fallout from that schooling - from students who attack their professors because they say something that goes against their "Christian" religion (never mind that what they think isn't even in the Bible, or even contradicts a careful reading of the scriptures), to vicious and hateful comments made in stores and in the public, to the forcing of religion on others. I think it also has a lot to do with Trump's win - in fact, IMO there are two reasons why Trump won. First, because of the Dominionists and church electioneering (on the sly if not overt), second because the Democrat elites INSISTED on forcing a "more of the same" candidate on us, when real change was needed. I have to keep our "No Trespassing" sign clear of any vines or brush - if it gets even partially covered we risk having proselytizers pounding on our door. I don't like to go into town because of the things I see and hear. I don't even like going to school because of the sort of signs and so on I see on the way (for instance - a rabidly dominionist Southern Baptist church advertising concealed weapon permits on the same electronic sign that they promote Christianist supremacy). Real change is going to happen - for the worse. Our only hope would be a real miracle or some form of intervention - and it will have to be from some agency not connected to liberals or non-Christians, because anything else will start a religious war in this country. The people we oppose won't listen (being nice to them is often taken as encouragement), it's going to take something big to make them open their eyes and change direction. If they win, we (who aren't part of their world) will suffer - long before the reality of what they advocate directly impacts them. I hope that the awakening doesn't come too late for the rest of humanity! There may be bastions of freedom in the upcoming years - liberal havens like parts of California or New England... but I would expect that they would be 'punished' just as the Christians around here like to punish people who exercise freedom of speech - and say things they don't like. They literally have no idea and are more worried about the trumped up fear of radical Islam instead of home grown radical Christianity. What the press can do to aleviate this is marked but who is researching this and what news paper would publish it? I talked with a colleague who works in the Mideast. There was a "Travel advisory" on at the time, and he said that with a couple of small areas (like a couple of neighborhoods), he considered it to be anti-Muslim propaganda rather than anything valid (and that he would travel in the Mideast without any qualms). One of my friends was doing research in countries that are portrayed as dangerous for Americans (the year before last), and had no problems whatsoever (he did have armed guards in the field, but that was against bandits). "he said that with the EXCEPTION of a couple of small areas (like a couple of neighborhoods)"
Well researched - with an excellent listing of sources for further study. Remember, that when providing education for children - at least through Jr. High and likely far beyond those years as well, these children have a great capacity to learn and assimilate information - but their life experience, provides few resources to evaluate what is true - and what is false. By my age - I have lived through the easy answers - explored options - and have actual memory of Vietnam - Civil rights - and our more recent social and political battles. I even remember the horror my parents spoke of, when they talked about the indoctrination of children in the Soviet Union or China - and now we attempt the same process. Good article Rachel. Got files with lots of this information. The troubling revised history from these types is at stake. I might ad the fabrication they print that "Jimmy Carter was allegedly a Christian." that I have to unlearn everything I was taught in the churches and a good deal of what I was taught in the schools. Like you said, I didn't have the experience or access to the information that allowed me to realize I was being fed bullsh*t. It took many decades of experience and years of higher education to come to that realization. I remember Vietnam quite well - and the situation was far more complex than ever portrayed. The Civil Rights years? Very vivid in my mind today... including the resentment from the other kids that they had to tolerate those horrible "N-word"s in their school and the hateful language spewing from the preachers. I've read what Frank Shaeffer had to say about it... and it makes sense of the things I clearly remember (the Moral Majority was started because they were bigots and didn't want to treat "black people" the same as whites). I remember the lies told about my people (American Indians/Native Americans) - in essence we were only good for the First Thanksgiving, Pocahontas, and "killing those nice, honest, Godly, hard-working settlers". At least the history books and teachers were honest enough in portraying the Civil war being about slavery and that "States Rights" was just a buzz-word phrase. Funny thing is that they portrayed reconstruction as partially an abuse of the South, without getting into the real complexity of the situation (and that a lot of the "Carpet-baggers" were Southerners returning to their homes and trying to get back what had been stolen from them by the more racist and conservative southerners). Oh, and the indoctrination - one of my professors worked in Cuba, and another was from the Caribbean Islands. I learned first hand just how much indoctrination is REALLY going on - here in the US. As an example - I remember watching a video in class where they talked about Aristide and the situation in Haiti. The funny thing was that on PBS THAT NIGHT they had the same exact interview, but I could see where they chopped off (edited) parts here and there to make Aristide look really bad, when the reality was that the person was rather admiring of him, but admitted to his being human and making occasional mistakes. It became obvious that the public video was meant to manipulate people against a liberal advocate for the people and put blame for the situation in Haiti on liberals and the Haitian people. Regarding Cuba - if the US hadn't been such a bully*, the situation would have been completely different. They had better medical care, and the society was far more egalitarian than portrayed (and not like portrayed) - and the suffering of the Cuban people was directly tied to US interference. The churches were repressed because they kept trying to re-establish the previous status quo (the rich in control). *-The US has invaded other countries several times to force them to obey US dictates - such as Haiti. The real history of this country is rather ugly, especially in how the Other has been treated. Problem is that most big religions are supremacist. Otherwise they would still be religious sects. I completely agree with this. Every region thinks they are right and are serving the one true god. In reality it might just be everyone is serving the same god in a different way. Nobody really wants to hear that but it is very interesting how the major religions today are all based around the same stories.